Burger King has just created the third-largest fast food empire on the planet by buying out Canadian fast food giant Tim Hortons for $11.4 billion dollars. The new combined company will sport 18,000 locations in 100 countries, and its single biggest market will be Canada. If that seems like a lot of locations, just know that roughly 10,000 of them (conservative estimate) are located in downtown Toronto; having just been there, I can say with confidence that Tim Hortons makes Starbucks look hard-to-find. For those Americans not yet familiar with Tim Hortons: it's basically an infinitely shittier Canadian version of Dunkin' Donuts. For some reason, Canadians do not share this opinion: they have a weird love affair/pride in Tim Hortons, which is a lot like an American proudly proclaiming their love for a dumpster fire. * If you've ever heard a wild-eyed Canadian go on a rant about "Timbits" and thought they were referring to the street name for some form of heroin, no, they're actually talking about one of Tim Hortons pastry products. As part of the deal, Burger King will move its headquarters from the US to Canada. For those thinking this move is designed to save the company tax money (which was my initial reaction, as well), it's really not going to save them much, if anything. While the corporate tax rate is technically 35% in America and 26.5% in Ontario, American corporations rarely, if ever, pay the full amount, and Canada has less loopholes than we do (imagine that). The idea seems more to be designed to appease Canadians "wary of a foreign company buying a national icon like Tim Hortons. "** Nevertheless, there's still been a predictable outcry from politicians. I know a lot of Canadians are going to freak out about this move due to their weird love affair with Timmy's, but really, it would be difficult for Burger King to make Tim Hortons worse than it already is. Besides, there's every indication Brazilian investment firm 3G Capital, the parent company of both entities, wants them to continue operating as usual: while the combined corporate HQ will be in Canada, both companies will be effectively run from their current home bases in Oakville, Ontario and Miami, Florida respectively. Interestingly, Warren Buffett also helped facilitate the deal: his Berkshire Hathaway is buying $3 billion worth of preferred shares in the combined company. In a completely unrelated note: screw you, Tim Hortons, for not using an apostrophe where you clearly should in your name, forcing me to spend way too much time taking out all the apostrophes I'd put in since my brain automatically corrects punctuation. * Or a KFC, which is more or less the same thing. 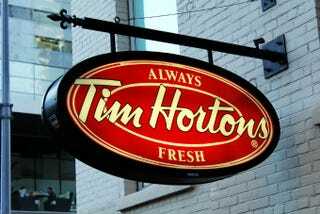 ** If Tim Hortons is a national icon for you, Canadians, you should really look into some new iconography.